Legendary bassist Peter Hook returns for An Evening with Peter Hook & the Light performing the legendary Factory Records’ albums Substance by Joy Division & New Order. Both albums will be performed sequentially and in their entirety this October in Australia and New Zealand. Released in 1987, New Order's Substance was originally conceived as a way for Factory Records boss Tony Wilson to play the New Order singles on the CD player of his new Jaguar car. Substance became Factory Records’ 200th release and remains the best-selling New Order album. Released in 1988, Joy Division's Substance features all the singles that didn’t appear on the Joy Division albums Unknown Pleasures and Closer, such as Love Will Tear Us Apart, Transmission and Atmosphere, plus their b-sides, tracks from their EP An Ideal For Living and a Factory Records sampler. Factory Records' 250th release, it begins with Warsaw and takes in the development of the band through Digital and Dead Souls to the band's final tracks. 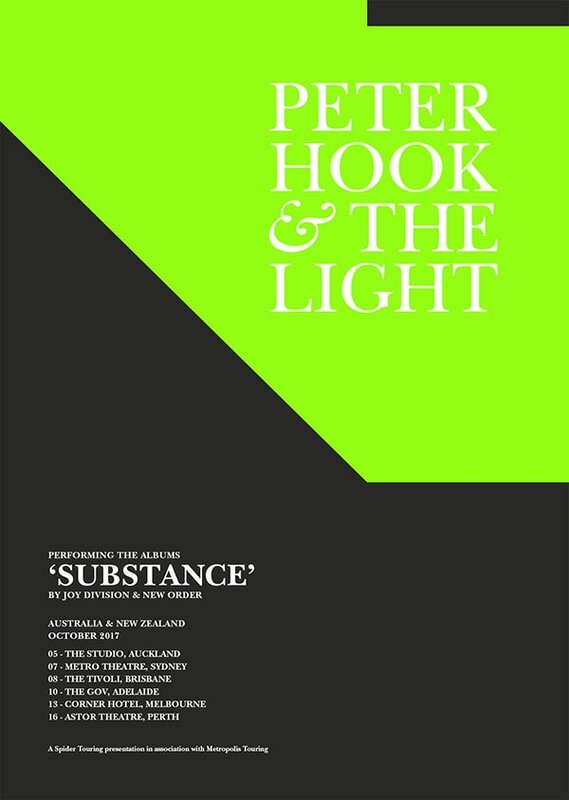 Since debuting with the Unknown Pleasures Tour in Australia in 2010, Peter Hook & The Light have since toured the globe including a return back Down Under in 2015 with the Low Life & Brotherhood Tour. This return in 2017 will be the most total appreciation to date of the Joy Division and New Order catalogue.